Walk though the history, funny facts and hidden secrets of the two most famous neighborhoods in Rio: Copacabana and Ipanema! We'll end in one of th most beautiful places in Rio: Rodrigo de Freitas Lagoon, where we'll have a FREE mini Brazilian pic-nic. The best way to see Rio de Janeiro!! During this 3-hour free walking tour we see the most important city center sights in Rio as Selaron Steps and Lapa Arches. At the same time we tell you about Brazilian history in a casual, interactive and entertaining way. - After the tour you can join us for a lunch where we have Feijoada - the most typical Brazilian dish - at a local restaurant and at the great price! In this food tour you’re gonna have the chance to try over 10 samples of Brazilian cuisine while you visit authentic, irreverent and awarded restaurants, also a local and historical bar in Santa Teresa! In partnership with BEM BRASIL: Rio has amazing parties every day, but if you don't know the right places to go you might end up by yourself in an empty bar! 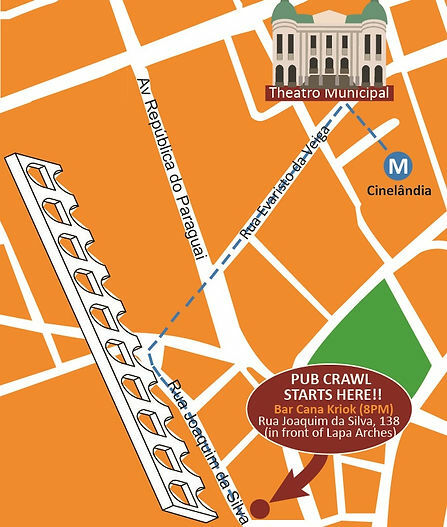 Come to our Pub Crawl on TUESDAYS nights and enjoy Ipanema busy bars and club, save money and party with an international crowd! - FREE shots & 01 Free snack! The best place to go parting in Rio de Janeiro from THUR to SAT? LAPA! Lapa nightlife is very unique and special, but can be pricey! In our Pub Crawl you'll save money and go to the best LOCAL places with an international crowd! After a long day in a new city, meet fellow travelers, sit back and focus on partying as your Pub Crawl leaders navigate you safely through Rio’s night life. - Learn how to dance SAMBA! Bar Cana Kriok - Rua Joaquim da Silva, 138 - Lapa (in front of Lapa Arches).